I originally hail from Cape May, NJ where I was enrolled in drawing and painting classes at the age of 4 – studying under artist Bob Roehrenbeck. I grew up taking Saturday art classes at the frame shop that he and his wife, Dolores, ran together. From Bob I learned line, shading, color, perspective, composition, and negative space – building the foundations of my talent – up until going away to The Peddie School at age 13. Because they had their own dark room, I focused more on photography at The Peddie School in Hightstown, NJ where I attended high school until my graduation in 2003, and I later went on to study Graphic Design at The School of the Art Institute of Chicago. Experimenting with analog photography became a small obsession of mine, and I maintain a collection of old cameras that I attempt to restore and use in my art. I like to play with all manner of mediums, having worked with Sound Design, Graphic Design, Clay Sculpture, Pottery, Woodworking, Multimedia Sculpture, Watercolor, Acrylic Paint, Oil Paint, Fabric Sculpture, Analog Photography, Digital Photography, Lithography, etc. – I do enjoy learning new techniques and mediums but I’d say that my strength is in painting and at this point I focus more on challenging myself to capture difficult visuals than on developing some sort of style. They say, “A Jack of all trades is a master of none, but often times better than a master of one.” I hold true to this – but I like to hope that, regardless of my varied interests, I’m well on my way to being able to consider myself a master painter. 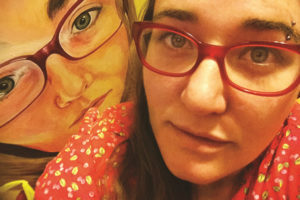 I currently reside in Pine Hill, NJ where I work as a freelance graphic designer and painting instructor.